Keeping track of client’s varied demands; we are involved in providing a diverse range of Phosphor Bronze Strips. Agrawal manufactures Phosphor Bronze Strips through Horizontal Continuous Casting route on Technica Guss (Germany) - Comptucast HCC Line. The Cast Strands are milled / scalped on In-Line Milling Machine to remove all the Oxides from both the surfaces before rolling. We are actively engaged in offering a wide assortment of Phosphorous Bronze Sheet, to meet the various requirements of our customers. Moreover it is thoroughly checked by our quality controllers to keep the product under strict supervision, so that we can deliver quality assured products to our valuable customers. 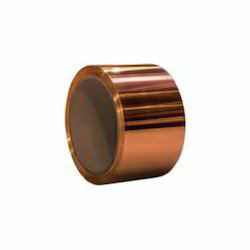 Phosphor Bronze - 5% Cold Rolled Strip (analysis above) has been cold reduced (By eight B & S gage numbers) 60.5% from its annealed condition to a tensile strength of approximately 100, 000 PSI and elongation in 2 of 4%.